The Virgin appears on a cloud, in which the heads of putti may just be seen. Although it is in fact monochrome, the photograph has been toned to match the colour of the original sheet. The drawing, in red chalk with pen and brown ink, is now in the Louvre. It is one of a series of studies made by Correggio for his fresco of "The Coronation of the Virgin", painted in the apse vault of the church of San Giovanni Evangelista in Parma (now largely destroyed) around 1522. It seems to represent an earlier stage in the evolution of the composition, when the Virgin was depicted in a more active pose than in the final painting. In fact, Ruskin misidentified the drawing, calling it a 'Sketch for the Assumption at Parma' - i.e. Correggio's fresco of the "The Assumption of the Virgin" in the dome of the Cathedral at Parma, painted between 1524 and 1530; the error was compounded by Cook & Wedderburn's incorrect annotation that the drawing was in Dresden. However, if the print is an oil print rather than a carbon print, it would be a later replacement for Ruskin's original image, as the technique was not invented until 1904. The image was first recorded in the Teaching Collection in 1870, when Ruskin listed it as no. 13 in the Standard Series in the "Catalogue of Examples". He considered it 'splendid, but, like all Correggio's work, affected' - and the effect of these affectations, which had been adopted by later artists who lacked Correggio's religious passion, was pernicious. On the mount, bottom centre, printed, in a cartouche: ALLEGRI. 13. Sketch for the Assumption at Parma. (Correggio.) Photograph from a red chalk drawing. 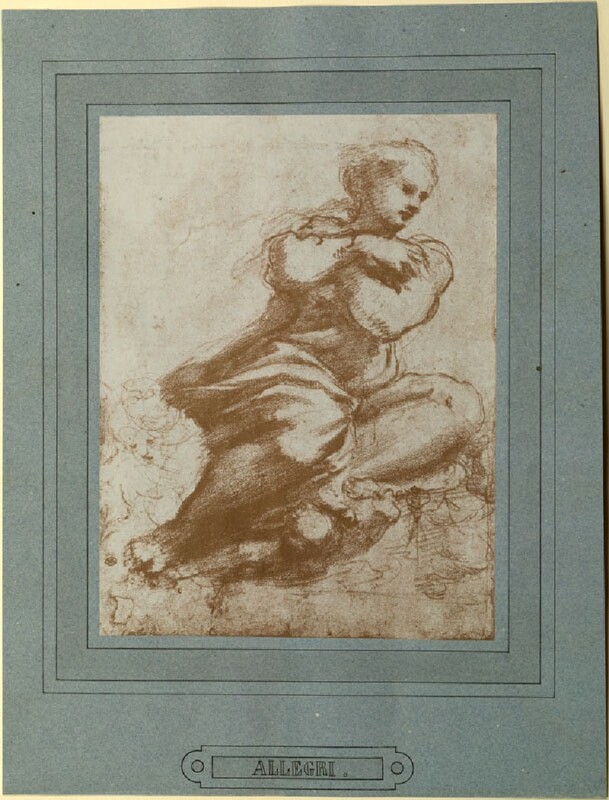 There are no engravings from Correggio (nor as yet can I find any photographs from his pictures) which sufficiently represent his real qualities. Many of them are in this sketch, but we must work together for many a day yet before you will rightly feel them. It is splendid, but, like all Correggio’s work, affected; and, while his skill remains unrivalled, his affectations have been borrowed by nearly all subsequent painters who have made it their special endeavour to represent graceful form, as the mannerisms of the religious schools have been imitated by men who had no part in their passion, until it is too commonly thought impossible to express either sentiment or devotion without inclining the heads of the persons represented to one side or the other, in the manner of Correggio or Perugino. There are no engravings from Correggio (nor as yet can I find any photographs from his pictures) which sufficiently represent his real qualities. Some of them are in this sketch, but we must work together for many a day yet before you will rightly feel them. It is splendid, but, like all Correggio’s work, affected; and, while his skill remains unrivalled, his affectations have been borrowed by nearly all subsequent painters who have made it their special endeavour to represent graceful form, as the mannerisms of the religious schools have been imitated by men who had no part in their passion, until it is too commonly thought impossible to express either sentiment or devotion without inclining the heads of the persons represented to one side or the other, in the manner of Correggio or Perugino.